If you are an outdoor enthusiast who is looking for a spotting scope capable of giving you bright, clear and crisp view when you are engaging in such activities as bird watching and watching wildlife, there are a number of spotting scope brands that can give you just that. A good example of such spotting scopes is the Gosky 20-60X 80 Porro Prism Spotting Scope, which is widely regarded by many outdoor enthusiasts as a quality, affordable and high performing spotting scope. In the Gosky 20-60X 80 Porro Prism Spotting Scope review below, we will be taking a look at the top-notch features of the product, its PROS and CONS as well as customers’ most commonly asked question. 1.7.1 Q. Who are the manufacturers of the scope? 1.7.2 Q. What is the scope’s magnification? 1.7.3 Q. What is the scope’s field of view? 1.7.4 Q. What are the scope’s eyepiece and objective lens diameters? 1.7.5 Q. What type of focusing method does it have? 1.7.6 Q. What are the dimensions of the scope? 1.7.7 Q. What is the eye relief of the scope? 1.7.8 Q. What is its exit pupil? 1.7.9 Q. How do I store the scope? 1.7.10 Q. How do I clean the scope? 1.7.11 Q. Besides the tripod and the digiscoping adapter, what are the other things that will be included in the purchase of the Gosky 20-60X 80 Porro Prism Spotting Scope? Thanks to the excellent digiscoping cell phone adapter that the scope comes with, a user can easily take detailed images and videos of distant objects by simply placing the camera of his or her smartphone to the eyepiece of the spotting scope and obtaining photos and videos with the smartphone’s camera through the scope’s eyepiece. This gives the user a relatively inexpensive and convenient way to take pictures and videos of the distant world without the need of a regular telephoto lens. When it comes to protection, the scope receives excellent protection thanks to its very durable magnalium framework, high quality shock-absorbing rubber armor and 100% fog-proof and waterproof construction, which allows a user to use the scope in any weather condition – even in the harshest weather imaginable. The scope comes with a metal tablet tripod, which if used effectively, will not only provide stable support for the scope but also steady the scope in order to get the best viewing experience or to capture sharp images or videos. The scope comes with an eyepiece shield, which when stretched out, performs its primary job of protecting the scope’s eyepiece from a number of things such as dust. 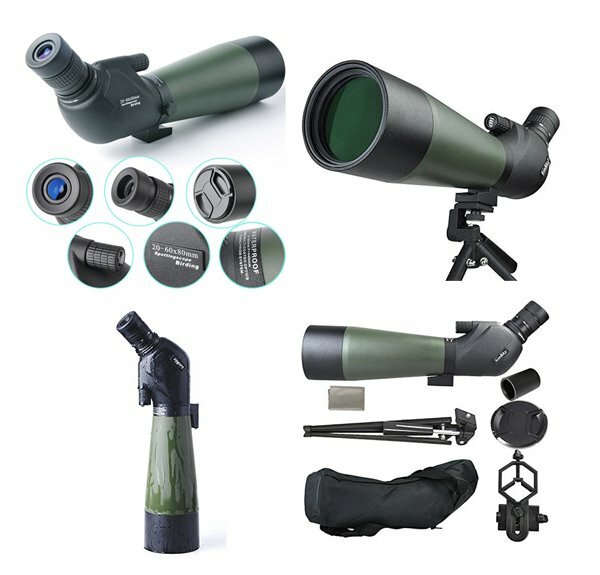 With great features such as a 20x-60x magnification eyepiece, a fully multi coated 80mm green film objective lens, quality prism and an excellent dynamic focusing system (which allows the user to easily zoom in on a faraway target), the scope is capable of delivering brighter, clearer view and images. Since it is hundred percent waterproof and fog-proof, the user doesn’t have to worry about fog or water when using it. 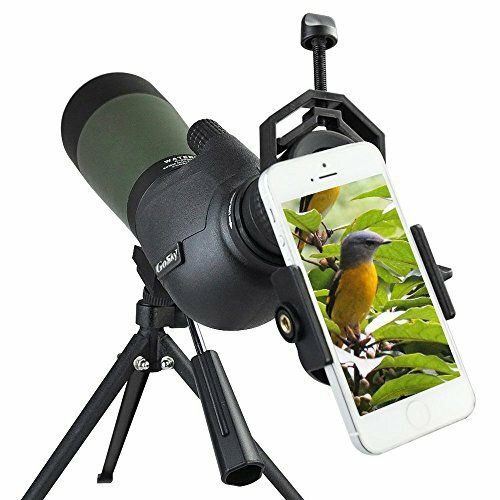 The digiscoping cell phone adapter that it comes with allows you to take pictures or videos in the distant world with your smartphone through the eyepiece of the scope. In addition to this, the scope comes with a phone clamp so you can easily take pictures and videos with your phone. It is a well built spotting scope. It is reasonably priced for all the excellent features that it comes with. The metal tablet tripod that the scope comes with would have been better if had been made stronger. Many consider the tripod’s cheap and poor quality construction to be the item’s weakest point. Q. Who are the manufacturers of the scope? A. The scope is manufactured by Gosky Optics, which has over the years made a name for itself supplying high quality accessories and products in the field of optics. A. The magnification of the scope is 20x -60x. Q. What is the scope’s field of view? Q. What are the scope’s eyepiece and objective lens diameters? A. The scope has an eyepiece diameter of 20mm and an objective lens diameter of 80mm. Q. What type of focusing method does it have? A. The scope has a central focus method. Q. What are the dimensions of the scope? A. The scope measures 450 x 170 x 110mm and weighs of 800g. Q. What is the eye relief of the scope? Q. What is its exit pupil? Q. How do I store the scope? A. When you are not using the scope, the best way to go about storing it is to place it in an environment that is cool and moisture-free. It is also imperative that you leave the protective lens cap on the scope when not in use. Q. How do I clean the scope? A. Use a small soft brush to gently remove dust and dirt from the lens. Then use a soft clean cloth to clean the lens from the center outward. You can moisten the cloth with alcohol for the best cleaning. It is imperative that you avoid touching the lens during the cleaning process so that your fingerprints don’t end up smearing it. In cleaning the scope’s body, all you need to do is moisten a soft clean cloth in warm water and use it to gently remove the dust and dirt from the scope. For a thorough clean, you can use a very mild soap in the cleaning process. Q. Besides the tripod and the digiscoping adapter, what are the other things that will be included in the purchase of the Gosky 20-60X 80 Porro Prism Spotting Scope? One carrying bag that allows for a protective and supportive way to transport the scope and its accessories from one location to another. A manual that gives instructions on how to operate the scope. As you have clearly seen from the review above, the Gosky 20-60X 80 Porro Prism Spotting Scope is equipped with lots of important features that allow a user to enjoy a great optical experience when engaging in activities such as bird watching and watching scenery and wildlife. In addition to this, the scope’s waterproof and fog-proof construction makes it possible to use it even in the harshest weather condition. These are just but a handful of the reasons why many outdoor enthusiasts find the Gosky 20-60X 80 Porro Prism Spotting Scope desirable.